June | 2012 | amidoinitrite? Know your audience – Anti-graffiti community service announcement, originally uploaded by Rowan Peter. An interesting approach to an anti-graffiti community service announcement by a local City Council. 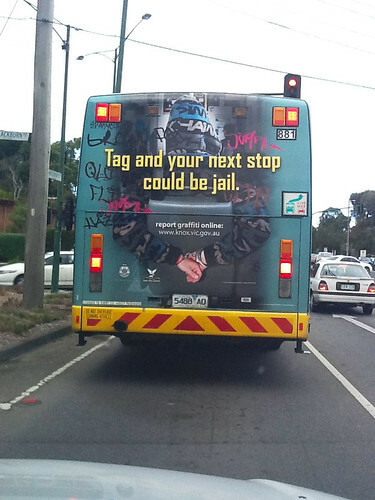 I’m curious if the outside of the bus is the most effective location for this kind of message. Would the outside of the bus be seen by the intended audience of this message. Are the target audience more likely to be inside the bus? Perhaps locating the community service announcement outside the bus ensures the message is exposed to as many people as possible. I didn’t see inside the bus, but I reckon this kind of message (framed in the format that it’s warning against) could also be placed inside the bus and perhaps be more likely be seen by the intended audience.